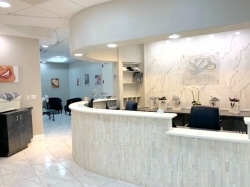 Summerlin Dental Solutions is the Premier Dental Office in Las Vegas, Nevada. Welcome to your new dental home. Las Vegas, NV, March 29, 2019 --(PR.com)-- Summerlin Dental Solutions celebrating complete office renovation for its one-year anniversary. However, it wasn’t only design and aesthetic that Dr. Cohan was aiming for when she began to renovate SDS. She wanted the practice to have the most current technology available to care for her patients. Dr. Cohan refers to herself as a “tech nerd.” Aside from having 50” screen’s in every operatory for the patients, she also is one of the few offices in Las Vegas that has a dental MRI (CBCT). Don’t think that because it’s their one-year anniversary that Dr. Cohan is new to the dental field. She received her Doctor of Dental Surgery (D.D.S.) from the State University of New York at Buffalo in 1992 and has been in practice for twenty-six (26) years. Dr. Cohan had previously built a highly successful practice from the ground up in Green Valley, NV. “We’re not finished, yet,” says Dr. Cohan. Although the dental office portion has been completed, Dr. Cohan plans on adding an extension to the current office offering cosmetic procedures, such as Botox, and fillers such as Restylane and Juvéderm. "Cosmetic procedures like Botox and fillers work extremely well to give you a full smile makeover that can completely change your confidence level," says Dr. Cohan. But, how much does it cost to boast a perfect, pearly white smile? Dr. Cohan notes that is a lot less than some competitors in the Las Vegas area since she is an in-network provider with almost twenty (20) insurance companies. If you don’t have dental insurance, SDS offers payment options like Care Credit to help ease the burden of needing expensive dental treatment. One thing is for sure, SDS should be your new dental home! SDS can be reached online at dentalsolutionslv.com or call them at (702) 341-9160.